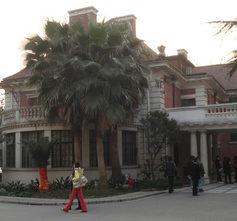 When I first went to China 22 years ago, I stayed at the Shanghai Conservatory of Music for several days. Many foreign travelers stayed in their international student hostel back then. A few weeks ago I found a link about Jewish Shanghai on an Asian Jewish Life tweet and thought back to that first trip as I read about a building at the Conservatory in the posted article. A plaque outside the colonial-style building identifies it as the former Shanghai Jewish Club, used for recreation and musical performances in the 1930s. You can walk in freely as the rooms are now offices… Behind it to your left you’ll find a German-style villa being gutted and rebuilt. In the 1930s and 1940s it was the clubhouse for Betar, a Zionist youth organization. I wish I knew this when I stayed at the Conservatory in 1988 and 1995 (and in 1991 when I stayed with my dad’s student’s family in Shanghai). When my ex-husband came to Chicago to visit our son last weekend, he told me about the changes at the Conservatory, where he and his wife now teach. “Many of the old buildings have been torn down,” he said. Maybe some of the crumbling Soviet-style cement blocks needed replacing. But I hope these old colonial buildings are preserved indefinitely, especially ones with roots like this old Shanghai Jewish Club.